Beautiful 5 Quarto, 3. 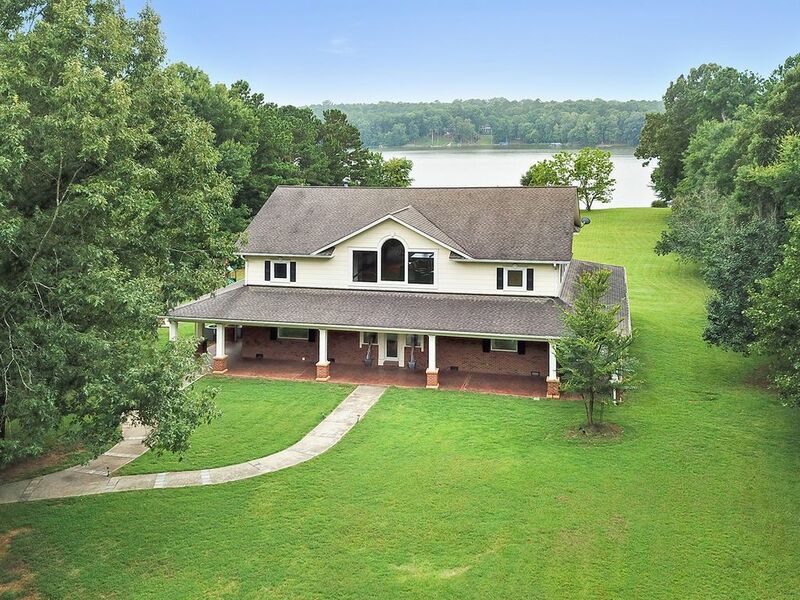 5 Bath Lakefront Home com vistas espectaculares do Lago Oconee (8 adultos e 4 crianças) - - Pet House Free. O calendário é atual. Venha e desfrute desta casa beira-mar situado em 8 hectares de terra no belo Lago Oconee. Localizado em Greensboro, GA, a apenas 80 quilômetros a leste de Atlanta, 40 quilômetros a sudeste de Atenas (casa dos Georgia Bulldogs) e a apenas 15 minutos do centro histórico de Greensboro e Madison. Esta propriedade está em uma excelente localização dentro de White Oaks Planation com uma excelente vista para igualar! Ao entrar na entrada longa e arborizada, você vai sentir a privacidade e tranquilidade deste refúgio majestoso do lago. O piso principal tem um piso plano aberto com uma abertura para comer na cozinha em uma sala ensolarada, bem como uma sala de jantar formal. Ele também inclui o quarto principal, lavabo e lavanderia. O grande mestre ensolarado tem portas francesas que abrem para o pátio com vista para o lago. Tem uma cama king size, walk-in closet e uma grande casa de banho privada com vaidade de casal e chuveiro cabeça dupla. Uma parede de janelas permite vistas de quase todos os assentos da casa. O nível superior tem uma grande sala grande com tectos abobadados e é ótimo para assistir filmes, jogar jogos, ler um livro ou simplesmente relaxar. A grande sala também contém um novo (adicionado em janeiro de 2013!) mesa de bilhar e mesa de ping pong top !!! Quatro quartos (1 rei, 2 rainha e 4 twin (2 beliches - apenas para crianças)) e dois banheiros no nível superior. Ambas as casas de banho juntam-se a todos os quartos em estilo Jack e Jill, permitindo privacidade. Esta casa pode acomodar mais de uma família ou apenas um casal à procura de um refúgio para relaxar. As características adicionais incluem cais privado max e área de natação, lançamento de barco privado dentro subdivisão, grande pátio com mobiliário de exterior, propriedade tem acesso a Oconee National Forest trail trail para caminhadas, cesta de basquete, um quintal de acre para jogar (ótimo para um jogo de futebol da família! ) e grandes vistas do lago em toda a volta de casa. Serviço para doze (12), incluindo lençóis para todas as camas, toalhas de banho e louça. Há muito espaço para se espalhar. Esta casa acomoda 8 adultos e 4 crianças confortavelmente. Esta casa lago está centralmente localizado fora do I20 na filial Apalachee do Lago Oconee em uma área conhecida por grande pesca e perto de restaurantes, marinas, grandes supermercados, Super Wal-Mart e muito mais. Peaceful Comfort for the Whole Family! We stayed at this house for a weekend get away! The kids enjoyed the large yard, fishing right off the dock and the tire swing near the water plus the board games and basketball hoop in the driveway. The adults enjoyed the fire pit, comfortable beds, plenty of bathrooms for everyone and the large well-stocked kitchen. The owner was easy to work with. We will definitely be back!! The property is amazing, very private and quiet, plenty of room for activities. The house was great also, very well stocked. We did have some problems with the WiFi dropping out which was a problem with our WiFi baby monitor we were using. Also the mattresses were a little too firm for everyone. Overall we were all very happy and would definitely come back. New Years Eve Stay - easy owner, great location! We stayed at this property over new years eve. The house had everything we needed. We disconnected from the world and reconnected with our long time friends. House is an easy 15 min drive to grocery stores and restaurants. We cooked and stayed in mostly and found the kitchen to have everything we needed. Large TV in family room was great for movie nights and the pool table got everyone's competitive juices flowing. We hope to return over the summer when we can get out on the water! Thank you! Lots of Space! Great for Families! Great stay! Owner was easy to work with. We were 2 families and felt like there was lots of space to spread out. The kids loved the toys, tire swing and play-set. Adults enjoyed the stocked kitchen, fire pit, and pool table. We'll definitely return! Exactly as described, clean, roomy and beautiful view. Loved this spacious house. Easy to enjoy with family. Lake view is beautiful. Property was well equipped for multiple families and friends on a very large lake front property. Our family which consisted of 8 adults and 1 child enjoyed our relaxing weekend. The property was large enough to hold us all! We enjoyed fishing from the dock and grilling on the nice covered wrap around porch. We didn't need to leave the house for other amenities. The owners were very nice and easy to work with. We would definately visit again! Rates are subject to change at any time. FALL & SPRING SEASON: $450/night rate applies if booking 3 or more nights. $500/night if booking 2 nights. Avoid VRBO "service fee" that is paid directly to VRBO/HomeAway with each online booking by paying by check. This fee does not add any value to your experience. Must agree to terms of rental agreement and abide by Greene County Code of Ordinances (including maximum overnight occupancy of 12 persons, maximum number of 6 vehicles at the property, maximum of 6 daytime visitors, trash disposal and noise regulations).